As businesses continue to replace paper documents, contracts, and forms with more efficient and cost-effective electronic substitutes, electronic signature technology becomes an increasingly important investment. The cost and time savings of doing business electronically are evident across many sectors and industries, yet many companies are still choosing which technology or method is best suited to their needs. Creating, signing, transmitting, and storing any and all documents electronically and in such a way as to be legally-binding can seem like a daunting task. “Electronic Signature” means data in electronic form which are attached to or logically associated with other electronic data and which serve as a method of authentication. 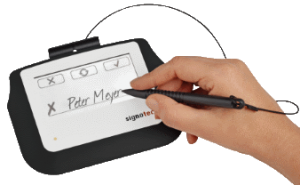 With the signotec software you can produce legal “advancend electronic signatures” according the directive of the European Parliament and of the council. d) is linked to the data to which it relates in such a manner that any subsequent change of the data is detectable.